The GBR seabed biota are represented by more than a dozen major phyla, which can be quantified in terms of biomass abundance, frequency of occurrence and numbers of species. Our understanding of these biota depends on the devices used to sample them. Animals living down in the sediments such as small worms, crustaceans and molluscs (infauna), usually are collected by a grab or core—a device not used by the Seabed Project. An epibenthic sled samples sessile biota and slow moving invertebrates (Fig. 6.3) living on the seabed or in the top few centimetres of the sediment, whereas a research trawl typically samples the more mobile fauna living just above the seabed, such as fishes and crustaceans. Together, the sled and trawl confirmed the dominant biomasses of algae, particularly green algae, in the areas outlined above (Figs 6.2, 6.3). After algae, sponges are the next most abundant group; encrusting and massive morphotypes may reach high biomasses in the higher current areas, stalked and cryptic types are sparsely distributed in sedimentary areas. Ascidians are the next most abundant sessile group and have a similar pattern of distribution, followed by cnidarians, which tend to be more restricted to the higher current areas and harder ground, as are bryozoans. Echino-derms are the most abundant and widespread of the mobile invertebrates, with overall biomass between that of sponges and ascidians. Molluscs, while widespread in softer sediments, appear to be about half as abundant. Fishes, better sampled by trawl, are next in abundance—inshore and muddy areas in particular tend to have high relative proportions of fishes. Crustaceans were much less abundant. These were followed by worms, elasmobranchs and minor phyla, none of which were well sampled by either device. The ordering of these groups by frequency of species occurrence differed from that of biomass. Fish species occurred most frequently, followed by crustaceans, molluscs, echinoderms, sponges, corals, algae and ascidians. 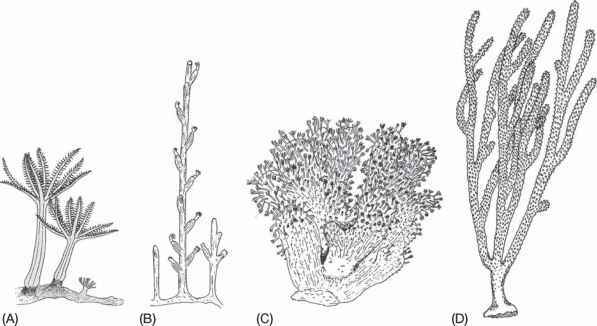 In terms of numbers of species, sponges were the richest with more than 1100 taxa, followed by molluscs (>1000), fishes (>850), crustaceans (almost 600), echinoderms (>500), algae (>400), corals (almost 400), bryozoans (>300) and ascidians (>300). These statistics indicate a very high diversity for the GBR seabed, yet the true diversity is much greater, given the infauna are not included and some phyla were not fully sorted. More detailed identifications of these samples, all of which are lodged with the Queensland Museum, will continue to reveal this diversity.